Future of America’s race relations: Why I am optimistic despite Ferguson and Staten Island. Even amid the racial turmoil of 2014, we are making progress. 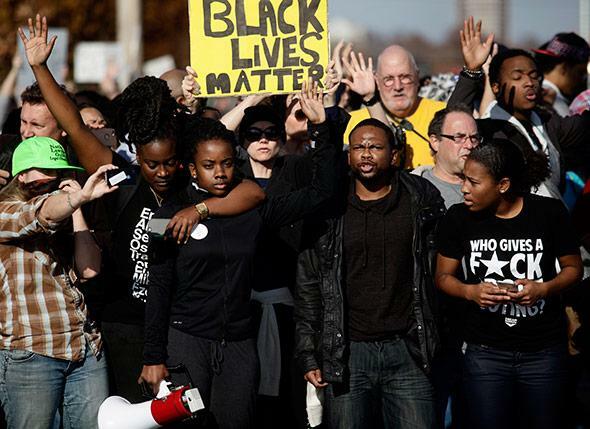 Demonstrators protest the shooting death of Michael Brown on Nov. 29, 2014 in Brentwood, Missouri. Photo by Joshua Lott/Getty Images. On race relations, President Obama is feeling optimistic. It’s easy to dismiss this as undue optimism or a retreat to 2008-style post-racial thinking, especially given events in Cleveland, Ferguson, and New York, and the stark divide in how blacks and whites see law enforcement. But Obama isn’t wrong. When it comes to race relations, America is better than it’s ever been. You can see this in the data. According to authors Lawrence D. Bobo of Harvard, Camille Z. Charles of the University of Pennsylvania, Maria Krysan of the University of Illinois, Chicago, and Alicia D. Simmons of Stanford University in “The Real Record on Racial Attitudes”—a paper in the 2012 volume of Social Trends in American Life: Findings from the General Social Survey Since 1972—whites have progressed on a wide range of measures. As recently as 1990, more than 40 percent of whites supported a homeowner’s right to discriminate on the basis of race; by 2008, that number had dropped to 28 percent (including 25 percent of highly educated Northern whites). The same goes for the percentage of whites who said blacks were “less intelligent” than whites, which dipped from nearly 60 percent in 1990 to less than 30 percent in 2008. And so few whites support school segregation that the General Social Survey has dropped the item from its questionnaire. Whites are also more tolerant of interracial marriage. When first measured in 1990, note the authors, fully 65 percent of whites opposed unions between close relatives and black Americans. By 2008, that number had declined to 25 percent, and in a 2013 Gallup survey, 84 percent of whites said they approved of interracial marriages between blacks and whites. Some of the most comprehensive polling–outside of the General Social Survey—comes from the Pew Research Center. According to a 2010 report, 64 percent of whites say they would be “fine with it” if a family member married a black American, while 27 percent say they would be “bothered” but accepting. Only 6 percent say they would reject the marriage. Support is lowest among older whites, and highest among white millennials, who don’t differ in approval from their black and Hispanic peers. It’s not all sunshine. As of 2008, according to the GSS, only a quarter of whites would live in a neighborhood that’s half black, and in a 2000 survey, 1 in 5 whites chose an all-white neighborhood as an ideal, while 1 in 4 chose one without any blacks. A plurality of whites still say blacks aren’t hard working—or at least, not as hard working as whites—and, notes Pew, most whites say the country has “done enough to give blacks equal rights with whites.” There are intense disagreements on police treatment, and nearly one-half of white millennials say discrimination against whites is as big a problem as discrimination against minorities. And in terms of criminal justice and punitiveness, we know that whites are more likely to support harsher punishment when the convict is black. Still, we’ve made genuine gains, and our time is an incredible departure from the relatively recent past, when apartheid ruled the South and racist attitudes were ubiquitous in every area of national life. Even now, with the spike in racial turmoil, we see change. White and black Americans were outraged by the choking death of Eric Garner in New York City, white and black Americans have united in protests against police brutality, and the otherwise indifferent Republican Party—with its largely white constituency—has begun to make small moves toward criminal justice reform, with support from major donors like the Koch brothers. If, like President Obama, you are optimistic about the direction of American race relations, the facts are on your side. With that said, we shouldn’t confuse optimism about race relations (or, again, how whites view blacks and other groups) with optimism about racial progress, or how groups fare in relation to each other. There, the news isn’t just bad—it’s bleak. This goes beyond the familiar facts about young black males and police violence. On the environmental front, black communities are exposed to more pollution—and suffer more pollution-related ailments—than any of their counterparts. Black unemployment is still double that of whites—even for college graduates—and the median wealth of black families has plunged since the Great Recession, all but erasing the gains of the previous three decades. Residential segregation and concentrated poverty are still the reality for many black Americans—the product of a half-century of discriminatory housing policy. Indeed, the typical middle-class black child encounters a level of poverty unknown to the vast majority of white children. Then there’s mass incarceration. In his book Punishment and Inequality in America, sociologist Bruce Western shows that prison is the dominant—and most formative—institution in the lives of poor black men in the United States. This is only loosely connected to crime; while poor black men commit more crimes than most other Americans, prison population growth doesn’t track national crime trends. In fact, crime among young black men has plunged, while incarceration has steadily increased. And incarceration isn’t the reason for the decline. “Roughly nine-tenths of the decline in serious crime through the 1990s would have happened without the prison boom,” writes Western. The long-term implications of mass incarceration are too large to examine here, but it suffices to say two things. First, that mass imprisonment of poor black men casts a pall over our narrative of economic progress. After adjusting for disparities in joblessness and incarceration, Western found that “young black men have experienced virtually no real economic gains on young whites in the fifteen years since 1999.” In fact, “around three-quarters of the apparent gains in relative wages are attributable not to a real improvement in the economic situation of African Americans, but to escalating rates of joblessness and incarceration [among the group].” The gains of young black men, touted in the heady days of the 1990s economic expansion, were illusory. Over all, because prison is a hugely corrosive influence on the course of an individual’s life, a whole cohort of poor black men should expect lives with insecure employment, low wages, family disruption, and social isolation. In all likelihood, the stratification in the black community—where the difference between well-off and worst-off is huge—will widen. If the reality of changing white attitudes are grounds for racial optimism, then the fact of black stagnation and retrenchment are grounds for racial pessimism. And there’s a strong case that the latter outweighs the former. Not only will these economic trends take decades to play out, but it’s unclear if Americans are willing to devote the time and effort to closing our racial gaps and integrating poor black Americans into the national mainstream. If the present push against equal participation—exemplified by voter ID and conservative attacks on the Voting Rights Act—is any indication, it’s hard to imagine a future where the public spends tax dollars to fix the consequences of its past discrimination. Worse, the same optimism around race relations could undermine a push to improve conditions—if things seem good, even if deep inequalities still exist, there’s no reason to make them better. Then again, you could say the same of America in the 1950s. Blacks won major victories, but an end to Jim Crow—much less attempts to ameliorate its effects—seemed far on the horizon. By the end of the 1960s, however, we had outlawed segregation, gained voting rights, outlawed housing discrimination, and oriented the entire federal government toward securing opportunity for black Americans. Yes, there were fierce reactions from the right, and many of the policies and gains have been compromised or—in criminal justice—actively undermined. But even at the height of the post-civil rights backlash, in the conservative jubilee of the Reagan years, there was no question that blacks were better off. This isn’t the soft bigotry of low expectations—it’s meaningful change. The black struggle for equal rights—for full partnership in the American experiment—obviously isn’t over. The proof is everywhere, from an unfair criminal justice system to an economy that discards black potential. If there is a question, it goes back to optimism versus pessimism. Should our steady progression make us optimistic? Or are our short memories (“redlining” means nothing to most Americans), backsliding (“Redemption” followed Reconstruction, mass incarceration followed the end of Jim Crow), and retreat to myth (We made it on our own, why can’t they do it) cause for pessimism?